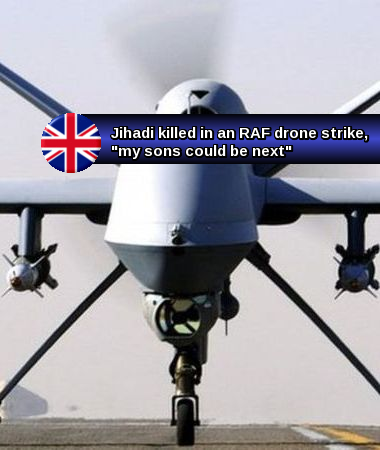 Home ISIS Terrorism UK Jihadi killed in an RAF drone strike, "my sons could be next"
Jihadi killed in an RAF drone strike, "my sons could be next"
OWoN: Some of the Muslim families of 'Shite' we killed by drone attacks now want to sue us. Really? How about instead you take your ragbag families back where you came from. 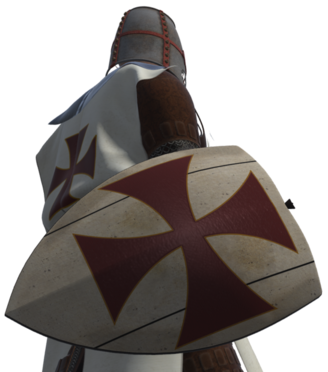 Your scum children attack us, we need to wipe them out and send you home! We did not ask you to come here, and most of us don't want you here. This is OUR Homeland, NOT YOURS. 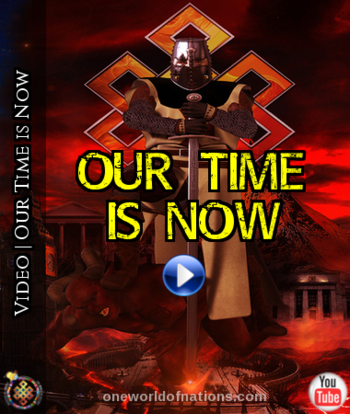 We will fight to the death to keep it, and your scumbag sons got what they deserved. Sue us, Screw YOU! Clearly you cannot raise decent, law abiding children, so why remain here? Have you no Shame? Time to rethink immigration. We let the lot of you in, it's time to pack the lot of you off. Allowing your lot in has always been a major problem. Time to man the barriers it seems. Fortress Europe. Because you screwed up your own countries does not give you the right, with your disgusting and ignorant 6th century, child molesting and mutilating religion, to come into a civilised society and attack ours. So all you Wog Warriors out there, be fully aware, you can't see our drones watching you, or know the extent of our eyes and ears all over you sons of Camel turd, or know that even from 3,000 miles away, it's just a touch of the strike button on our keyboards, and you won't even see what kills you. Maybe it's time to sell media copies to allow thousands of Westerners to share Drone access and to pay a fee to be the first to whack each of you Dog Turds identified as ISIS, or any other of your Puke ignorant terrorist groups. Whack a Wookie would outsell any Video game out there. Time to review families not fit for purpose. Deportation tops the list. Mass grouped even better. The father of two extremist brothers who fled Britain to join ISIS with drone strike victim Reyaad Khan fears his sons could be the next targets. David Cameron revealed the RAF killed Khan in a secret operation on August 21 because the former student was 'directing murder on our streets'. Today the father of Nasser and Aseel Muthana, both friends of Khan from Cardiff, fears they too could die in a drone attack. Ahmed Muthana said: 'I am frightened because my sons are out there too. I worry that they could be on a hit list. I don't think I will ever see my sons again. 'I know I won't see them again. I am sad they have gone'. Khan may have been on a Government 'kill list' with at least ten British Isis fighters on it, including the terror group's executioner in chief Mohammed Emwazi, known as Jihadi John. Nasser Muthana, a former medical student, appeared in the ISIS recruitment video alongside Khan and fellow drone strike victim Ruhul Amin. Despite his assassination friends say 21-year-Reyaad Khanw was not charismatic or powerful enough to mastermind an atrocity in the UK. The Prime Minister argued his death was an act of self defence but friends believe the 'brainwashed' former student should have been intercepted by the security services before he fled Cardiff for Syria last year. This view was not shared by the teenage daughter of David Haines, the British aid worker who was beheaded by Islamic State last year. Bethany Haines, 18, told ITV News: 'I think the drone attack is a step in the right direction - but I think more direct action is needed. 'More strikes need to be carried out and not just on British jihadists, but on ISIS in general. Khan was said to be plotting an atrocity at an event attended by the Queen and was used as an ISIS poster boy to lure jihadists to Syria and Iraq. Before his death he could have faced a war crimes trial over the mass executions of prisoners, which he boasted about online along with gruesome pictures of decapitated bodies. Yet today the Muslim community in his home town expressed its 'shock' at his death and said they believe he was not a direct threat to Britain. Other neighbours in his terraced street in Cardiff said frankly: 'He got what was coming to him'. Saleem Kidwai, Secretary General of the Muslim Council of Wales, told the BBC: 'We are not convinced (about the evidence) because he was not the kind of charismatic person who could control something like this from far away. 'As the news spread around the community the questions are being asked, what information did the intelligence or the government have'. The grieving mother of Reyaad Khan was today 'sick with grief' over the death of her terrorist son killed in an RAF drone strike. Rukia Khan, 41, who begged her son to return home, has been left devastated after he was killed in Syria in a targeted attack authorised by the UK Government. His father Nazim, 46, was today caring for his wife at the family's Cardiff home which Reyaad fled to join Islamic State jihadists two years ago. His parents were 'healing their wounds' on the revelation that their son was the first British citizen to be killed in a targeted drone attack. Speaking on the doorstep of his Cardiff terraced house Nazim said: 'I must go and look after my wife as she is very sick. Friend Mohamed Islam said that his family is 'devastated' by his death and his mother Rukia, who had begged him to return home, was 'broken' by the news. He said: 'The family heard a couple of weeks ago. I don't think they were informed of the British involvement'. Mr Islam has called on David Cameron to reveal 'the truth of this incident'. He added: 'It's a devastating situation for us as a local community. In the coming days and months the members of the public would like more details'. People at the mosque used by the family of Reyaad Khan admitted that they had no idea he had been killed by an RAF drone. A member of the mosque who only wanted to be known as 'Shamsu' said about British forces having killed Reyaad: 'It makes it worse because it's like your own country that's killed you. Another friend, who did not want to be named, believed his parents were not aware he was killed by the RAF. The family live in a terraced house two miles from Cardiff city centre and close to the Cardiff City football stadium. Roofer Steve Leyshon, 32, said: 'He had what was coming to him. He threatened to kill us so we killed him. But fellow neigbour Pete Kaminski, 52, said: 'I'm not happy that we killed a British boy like that. We should have brought him to justice not execute him. Khan was believed to be towards the top of a British 'kill list', which the Government has denied exists. 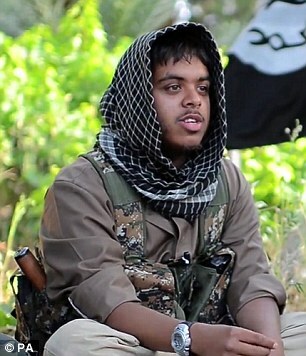 A second Islamic State fanatic from Britain, Ruhul Amin, died when Khan, the main target, was killed. A third, Birmingham hacker Junaid Hussain, was killed three days later by a US drone in a joint operation with the UK. Junaid's mother, Shareen Hussain was stony-faced as she left her Birmingham home this morning and refused to speak. 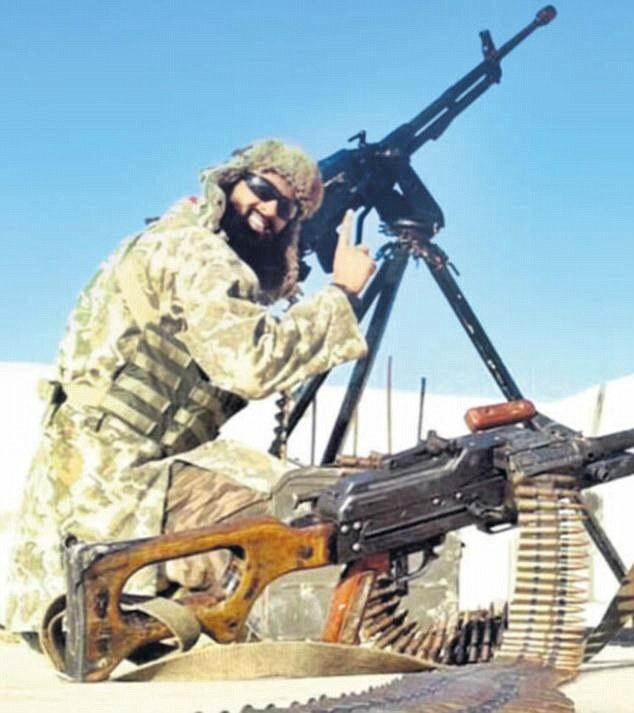 A neighbour, who did not want to be named, said: 'He deserved everything he got, all of the ISIS fighters do. Khan and Amin were blitzed by a drone controlled by RAF pilots sitting 3,000 miles away in Lincolnshire. 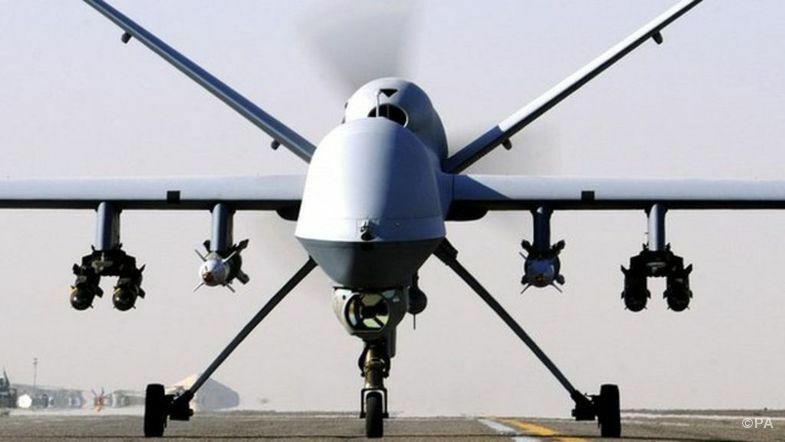 The experienced airmen were operating the controversial £10million Reaper unmanned aerial vehicle (UAV) from a hi-tech control hub at RAF Waddington. As the unsuspecting jihadists travelled in a vehicle in Raqqa, capital of the so-called Islamic State, they were wiped out by a laser-guided Hellfire missile. Pilots from 13 Squadron ordered the craft – about the size of a small executive jet – to carry out airstrikes from a height of up to 50,000ft using its fearsome arsenal. Before Khan's death he could have faced a war crimes trial as he repeatedly uploaded bloodthirsty posts and pictures on social media bragging about the inhumane killings. In one he posted graphic photographs of the distorted corpses of alleged victims, tweeting: 'Guys we caught & executed. This is how they looked less than an hr l8er'. 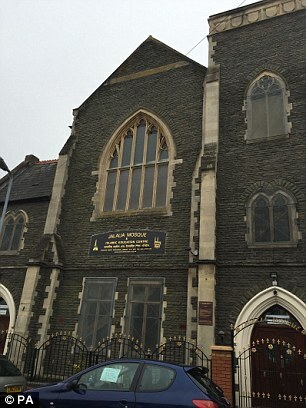 Khan is believed to have been radicalised through extremist websites in his bedroom in Cardiff. The revelation that Khan, 21, from Cardiff, had been assassinated in the first RAF drone strike against a Briton triggered claims of extra-judicial killing. But Mr Cameron insisted the attacks were an act of self-defence and not a softening-up exercise to persuade Parliament to vote for further military action against Islamic State targets in Syria. Some of the IS plots had been foiled while others were still active, he added. He said Khan and Hussain were orchestrating attacks on 'high-profile public commemorations' over the summer from the IS stronghold of Raqqa. Targets included VJ Day last month and the VE day commemorations of May 8. 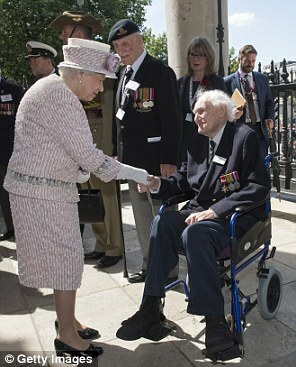 The commemorations were attended by scores of war veterans and dignitaries – including the Queen. Other events in the fanatics' sights are understood to have been Armed Forces Day in June, which marked the murder of Lee Rigby by two Islamist extremists, and the 100th anniversary of the Anzac landings at Gallipoli in April. Mr Cameron had been expected to deliver a statement to MPs solely on the refugee crisis caused by the war between IS and the Syrian regime. But, after pledging to provide sanctuary to 20,000 Syrians, he shocked MPs with the revelations about the operation against Khan, who has featured in IS recruitment propaganda. Ex-Conservative Attorney General Dominic Grieve said the strikes were 'draconian', adding: 'I strongly suspect it will lead to a legal challenge.' Kate Hudson of the Campaign for Nuclear Disarmament said it was an extra-judicial killing. Michael Fallon today defended the targeted drone strike to kill a British jihadi in Syria and vowed he would do it again. The Defence Secretary ordered the extraordinary use of military force in Syria without parliamentary authority to kill Cardiff schoolboy Reyaad Khan, 21, who was accused of plotting bloody attacks on the streets of Britain. Mr Fallon warned there were more jihadis in Syria orchestrating atrocity in the UK, Australia and the United States and he 'would not hesitate to do it again'. And he attacked the 'absurdity' of British armed forces being authorised to carry out missile strikes against ISIS in Iraq but not in neighbouring Syria, described as the 'brain cell' of the fanatical group. The Prime Minister said he would stick to his pledge to hold a Commons vote – probably next month – before ordering the RAF to conduct bombing raids against Islamic State terrorists in Syria. 'I believe that case only grows stronger with the growing number of terrorist plots being directed or inspired by IS's core leadership in Raqqa,' he added. But Michael Clarke, of the Royal United Services Institute, a think-tank, said Mr Cameron appeared to be trying to 'log-roll a controversial issue through Parliament' by wrapping it up with the high-profile case involving Khan. 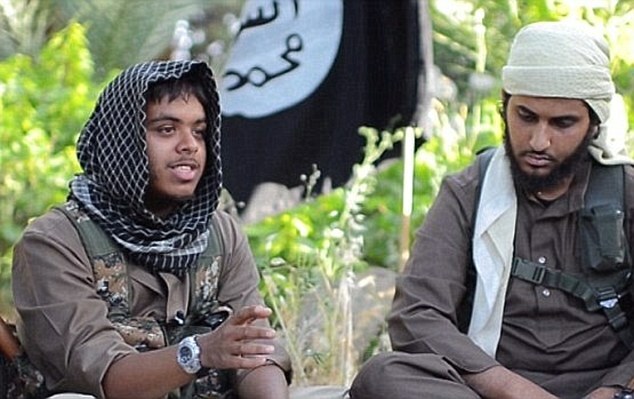 Khan, who was previously a straight A student in Cardiff, became a poster boy for ISIS when he appeared in a propaganda video entitled 'There Is No Life Without Jihad' in June last year, urging Westerners to join the war. Later attending St David's Catholic sixth-form college in the city, he was described by friends as a studious pupil who loved sports. At the time of his disappearance, Khan's family said they were desperate for him to come home. His mother Rukia, 41, pleaded: 'Please come back before it is too late. You are my only one son. I love you so much.' The family has not commented since. Student Rahul Amin moved from Aberdeen to Leicester and his family is believed to have returned to Bangladesh. Mr Cameron was humiliated in 2013 when Tory rebels joined with Labour to vote down a plan to launch missile strikes against the Assad regime. The Prime Minister, Chancellor George Osborne, Defence Secretary Michael Fallon and Foreign Secretary Philip Hammond have agreed there is a 'strong case' for action in Syria as well as neighbouring Iraq. A vote on joining bombing raids against ISIS is expected in the Commons next month. Briton Junaid Hussain, 21, who died in a US strike four days after Khan and Amin, was no.3 on America's ISIS target list due to his hacking credentials and key role as a foreign fighter recruiter for the jihadi group before the United States killed him in a drone strike. 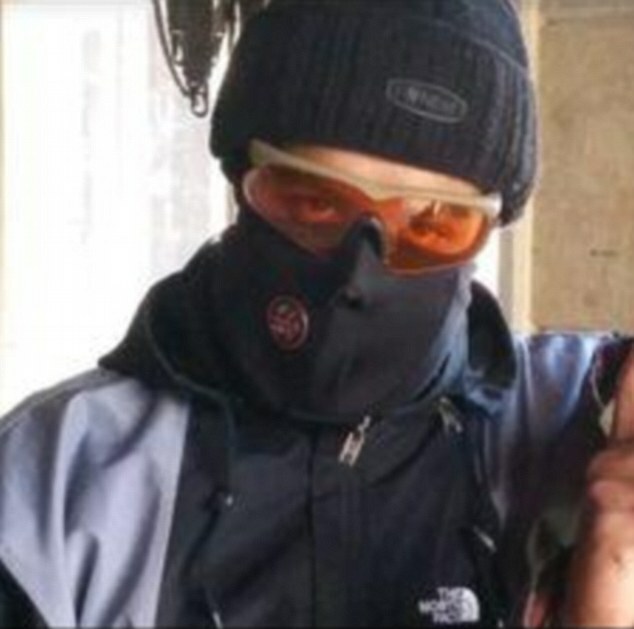 Reyaad Khan was an ISIS poster boy who appeared in a shocking recruitment video aimed at luring jihadists to Syria and Iraq. Before his death he could have faced a war crimes trial as he repeatedly uploaded bloodthirsty posts and pictures on social media bragging about the inhumane killings. His claims about his involvement in the crimes carried out by a unit of ISIS are now being investigated by the United Nations. 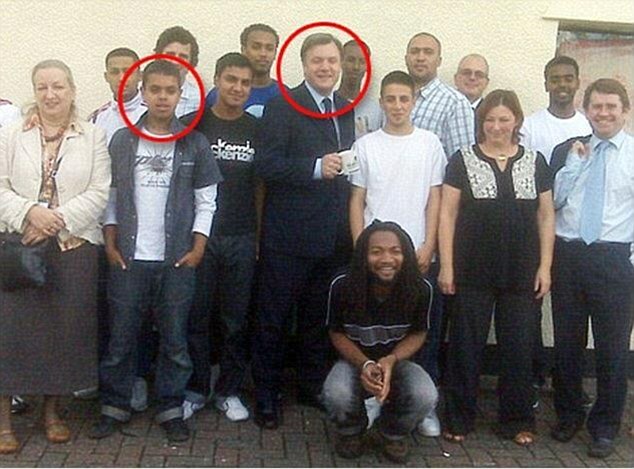 It was all so different back in 2009 when Khan, then 15, was said to be thrilled to meet former Labour minister Mr Balls. Just a year after the picture was taken, Khan spoke on a film of his wish to rid the world of 'evil' and of the problems of growing up in a deprived inner-city area. He also once said in a Facebook post he wanted to become the country's first Asian Prime Minister after sitting on a local youth forum. Going by the nom de guerre Abu Dujana Britani, had previously boasted of being prepared to be a martyr and claimed he was planning 'fireworks', meaning to become a suicide bomber. Confirmation of his death comes after a number of ISIS supporters claimed on Twitter last month that he had died. 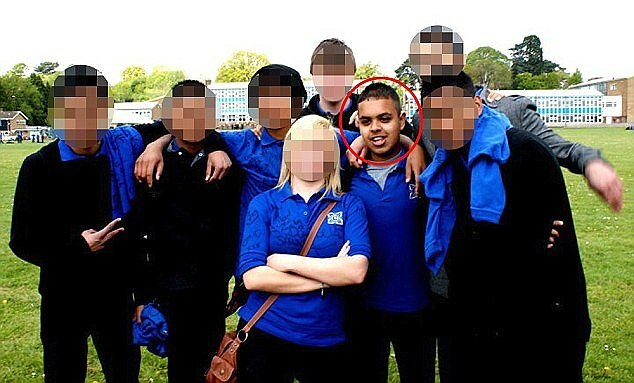 Khan – a former pupil at Cardiff's Cantonian High School in Cardiff – was described by friends as a studious pupil who loved sports. From there he went to St David's Catholic sixth-form college in the city. He left for Syria in 2013 with medical student Nasser Muthana, 21, who was joined in Syria three months later by his younger brother, Aseel, 18. Nasser had taken £100 from his father to go on an Islamic seminar in Shrewsbury in November, but instead went to Syria. Aberdeen schoolboy Rahul Amin, who also died in the attack on Khan, appeared in a now notorious recruitment video for Islamic militant group ISIS and fled to Syria after breaking up with his fiancée. 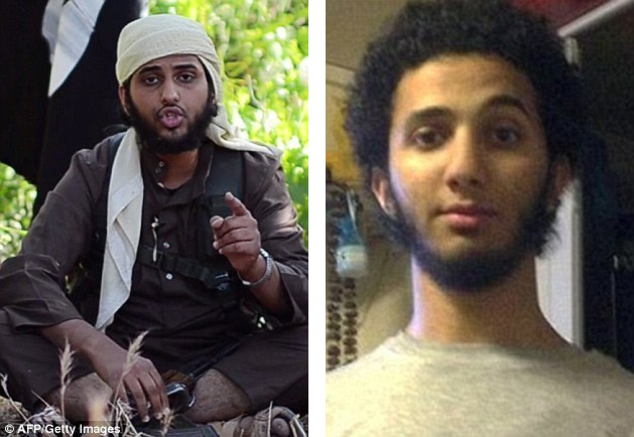 Amin was filmed alongside fellow Britons Reyaad Khan and Nasser Muthana, both 20, urging other Muslims to fight for Isis in the Middle East. Wearing wrap-around sunglasses and a white scarf around his head, Amin described jihad as 'the cure for depression' in the video. Speaking in front of Isis's black flag, he says: 'Are you willing to sacrifice the fat job you've got, the big car you've got, the family you have? Are you willing to sacrifice this, for the sake of Allah? Amin was educated in Aberdeen after moving from Bangladesh and his family left the Scottish city for Leicester a few years ago, according to reports. He was said to have been 'brainwashed' after he became depressed when he split from his girlfriend. Junaid Hussain, 21, was no.3 on America's ISIS target list due to his hacking credentials and key role as a foreign fighter recruiter for the jihadi group before the United States killed him in a drone strike. Hussain, who fled Birmingham in 2013, was married to 'Mrs Terror' Sally Jones, a 44-year-old rocker turned Muslim convert from Kent. She met the jihadi fighter online and left the UK with her son to join him in Syria. Jones, who now refers to herself as Sakinah Hussain, reportedly told a British jihadi bride that her husband had not been killed in an airstrike and was alive and well, which David Cameron proved false today. 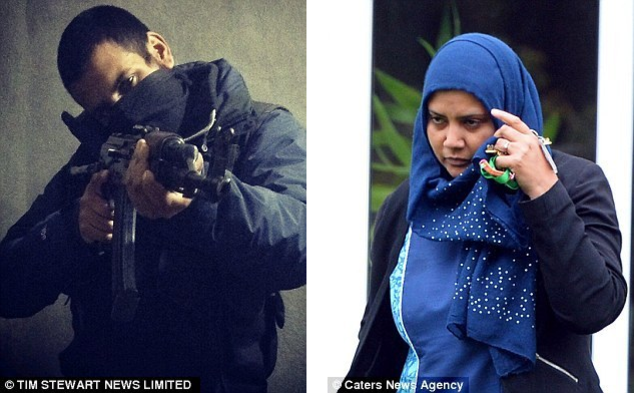 Hussain's wife, dubbed Mrs Terror, said she is 'blessed her husband is still alive,' according to the British jihadi bride. Just before his death Jones and her husband made headlines after they sent bombmaking manuals and boasted of 'lone wolf' terror attacks to investigative journalists, posing as jihadi brides. Computer hacker Junaid was well known on social media, frequently creating new accounts in order to threaten terror attacks on the West. In June this year, he was linked with an IS plot to attack an Armed Forces Day parade in south London. It was believed the plan was to carry out pressure cooker bomb attack, similar to the Boston Marathon attack in 2013. The intended targets were soldiers and bystanders on the route. The plan was scuppered only after Hussain unwittingly recruited an undercover journalist. He told the investigator: 'It will be big. We will hit the kuffar (unbelievers) hard InshAllah. Hit their soldiers in their own land. InshAllah. Soldiers that served in Iraq and Afganistan will be present. Jump in the crowd and detonate the bomb. The row over the legality of the drone strike in Syria has echoes of the way Tony Blair took Britain to war in Iraq more than a decade ago. The Labour Prime Minister justified the 2003 invasion on the basis of disputed reports about weapons of mass destruction. The then attorney general, Peter - now Lord - Goldsmith, changed his mind about the legality of war, first rejecting then approving the invasion. The legal advice was not published at the time but extracts were released by the Chilcot Inquiry in 2010. The Labour party has now called for the legal advice on the missile strike against Reyaad Khan to be published - something David Cameron has refused. Ministers insist that the legal advice given by Tory attorney general Jeremy Wright was 'absolutely clear'. Under Article 51 of the UN charter, countries have an 'inherent right' to act in self-defence 'if an armed attack occurs against a Member of the United Nations'. The debate will now focus on the extent to which Khan - living 3,000 miles away in Syria - posed a direct threat to Britain. Defence Secretary Michael Fallon told the BBC: 'The advice here is absolutely clear. 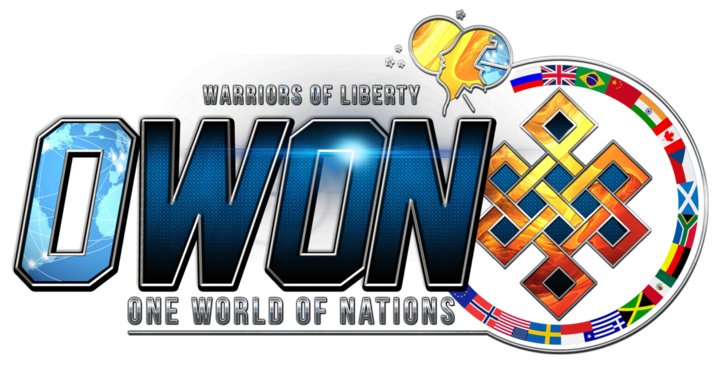 Any country has a right to self-defence and to protect itself against armed attacks. 'It's the same basis on which the military can use lethal force if as a way to prevent potential loss of life. 'Unmanned aircraft still have pilots that need to confirm with rules of engagement that I set. 'Any military strike like this has to be done in accordance with rules we set out. It has to be absolutely necessary, proportionate and avoid civilian causalities. But critics accused the government of 'extrajudicial killing'. An ISIS-inspired terror plot to kill the Queen was foiled just a week before the drone strike was launched by the RAF. Last month it emerged that intelligence services had uncovered a plan to use an Improvised Explosive Device to murder the Queen, dignitaries and veterans at a VJ Day parade. A major security operation was launched over fears of terrorists intent on causing carnage at the event on August 15 to mark the end of WWII in the Far East, during which 30,000 British troops were killed between 1941 to 1945. Downing Street refused to confirm which events were targeted by Khan. But David Cameron told MPs he was behind 'plots to attack high profile public commemorations, including those taking place this summer'. Could families of dead fanatics now sue the UK government? Britain could be sued by the family of dead ISIS fanatic Reyaad Khan, ministers were warned this afternoon. David Cameron today repeatedly insisted that the government's decision to authorise the drone strike was 'entirely lawful' and compatible with UN rules because the government was acting in self-defence. The airstrike was signed off as legal by the Government's most senior lawyer after intelligence chiefs alerted ministers to Khan's planned terror plots in Britain this summer. Under article 51 of the UN charter countries have an 'inherent right' to act in self-defence 'if an armed attack occurs against a Member of the United Nations'. However, the former Attorney General Dominic Grieve tonight warned that the government would be unable to release the secret intelligence which showed Britain was under threat. This would leave the government open to being sued by Khan's family, who live in Britain. Downing Street has confirmed the full details of the legal justification for the strikes will not be published. 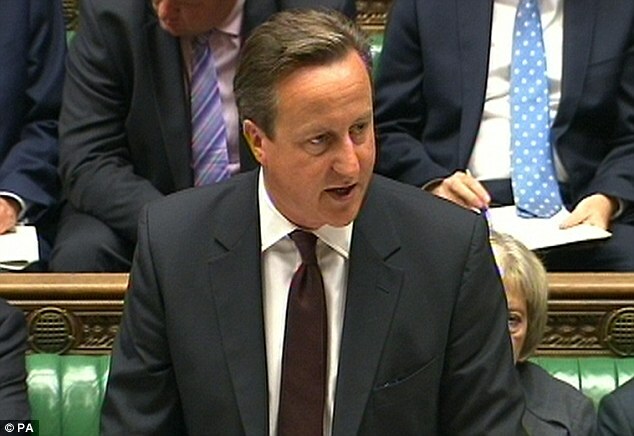 Mr Cameron said Britain's intelligence agencies had identified the fanatic as a direct threat to the UK. The PM said the National Security Council then agreed that 'should the right opportunity arise, then the military action should take action'. 'The Attorney General attended the meeting and confirmed there was a legal basis for action. And on that basis, the Defence Secretary authorised the operation. 'Critics of the 2003 invasion have repeatedly claimed that it broke international law and accuse Tony Blair of taking the country to war on a lie.